The new loan facilities allowed the Company to consolidate its debt structure at low rates while extending amortization and lowering monthly debt service. Additional working capital was also generated from the recapitalization. Essex Capital Group, Inc. is a Tampa, Florida-based corporate finance firm serving small and middle market privately-held companies located throughout the United States. With extensive capital markets experience, Essex provides creative solutions to businesses in need of financial restructuring. Typical advisory services include balance sheet recapitalizations with senior and subordinated debt. 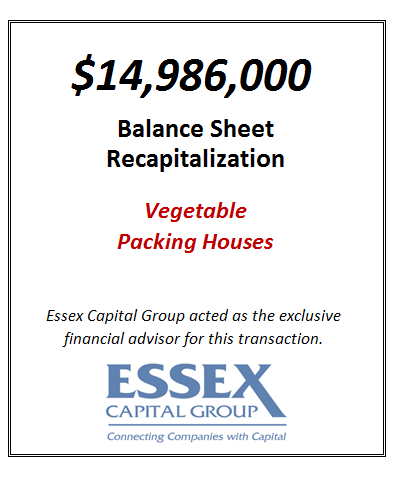 Since inception in 2003, Essex has successfully raised in excess of $700 million for 120+ corporate finance clients.